A very special nature reserve in northern Damaraland, the 450,000 hectare Palmwag Concession (or Palmwag Reserve) offers true wilderness safaris with a focus on tracking desert adapted black rhino with the help of the Save the Rhino Trust – an admirable organisation which was founded in 1982 to protect the desert black rhinos from poachers. The Palmwag Concession now holds the largest free-roaming population of the critically endangered black rhino in Africa and is one of very few places where rhino numbers are steadily increasing thanks to the vigilance, monitoring and conservation work of the Save the Rhino Trust. It is an exhilarating and unforgettable experience to approach the black rhinos on foot – a rare opportunity and available in the concession. 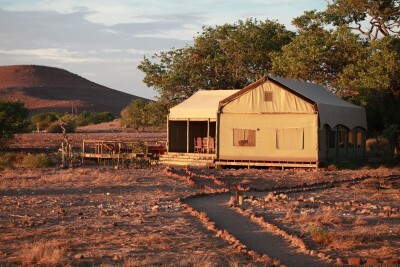 A breathtaking arid wilderness of rocky landscapes, grasslands and normally dry river courses against a backdrop of the flat-topped mountains of the Etendeka Plateau, the Palmwag Concession has much more to offer besides black rhino. The morning fog drifting inland from the Skeleton Coast brings life-giving water for all manner of strange flora, including welwitschias, salvadora bushes, bottle-shaped pachypodium trees, poisonous euphorbias, leadwood trees, shepherd’s trees and more. Freshwater springs support diverse fauna including giraffe, kudu, Hartmann’s mountain zebra, gemsbok (oryx), springbok, klipspringer and steenbok. Desert elephants roam through the concession, browsing along the Uniab River line. Predators include a good number of elusive desert adapted lion as well as cheetah, leopard, spotted and brown hyena, black-backed jackal, spotted genet and meerkat (suricate). Birding is productive with endemics including Rüppell’s korhaan, Benguela long-billed lark and Herero chat. Raptors include Verreaux’s eagle, booted eagle, lanner falcon and greater kestrel. Other birds such as the loquacious and brightly coloured bokmakierie, Monteiro’s hornbill, white-backed mousebird, Namaqua sandgrouse, Burchell’s courser and grey-backed sparrowlark will keep you entertained whilst waiting for the radio call from the Save the Rhino Trust tracker that they’ve spotted a rhino.